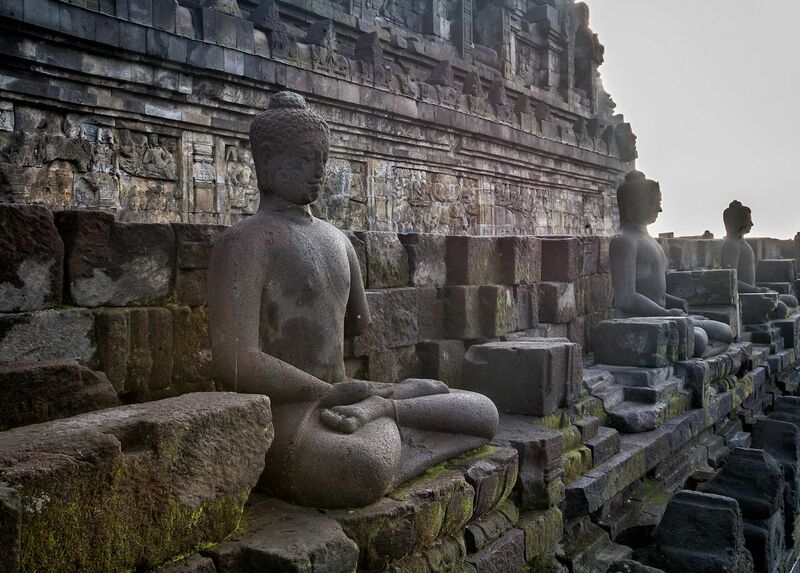 Borobudur, in Central Java, Indonesia, is the world’s largest Buddhist temple. It was built by the Kings of the Sailendra Dynasty around 750 AD — about 400 years before Cambodia’s Angkor Wat or any European Cathedrals. Borobudur is one of the world’s most complex buildings, its creation shrouded in secret without any written records or information about what purpose it served. 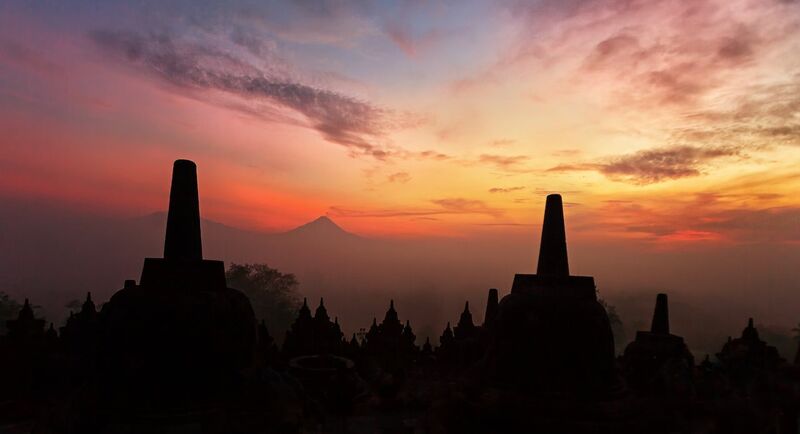 Borobudur is bound forever to remain a mystery. From the distance, the temple resembles a big lotus flower bud floating on a lake and ready to bloom. There is a single stupa built from volcanic rock, which has the form of a giant tantric Buddhist mandala when viewed from above, simultaneously representing the Buddhist cosmology and the nature of human mind. 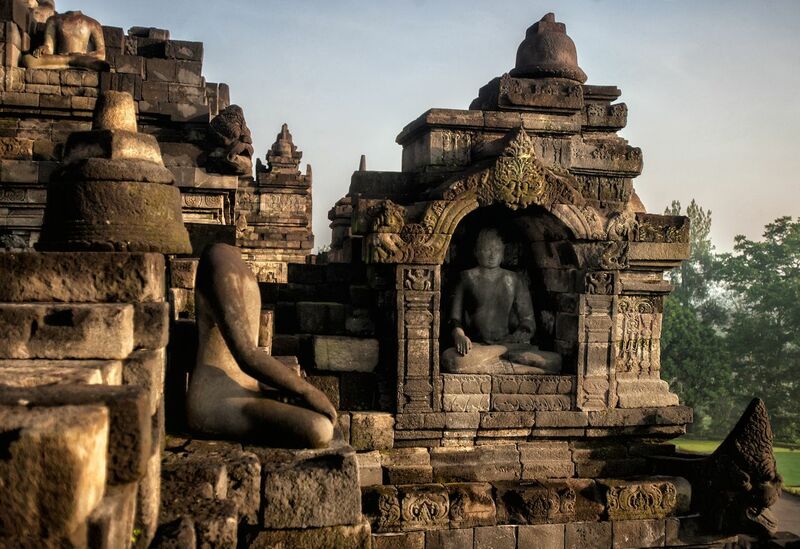 Around 16th century A.D., Borobudur was left slowly to decay on its own. Volcanic eruptions deposited ash in the fertile soil, supporting the rapid growth of lush vegetation which engulfed the temple — echoing the poetic cycle of Hindu mysticism: Never-ending creation (Brahma), destruction (Shiva), and preservation (Vishnu). 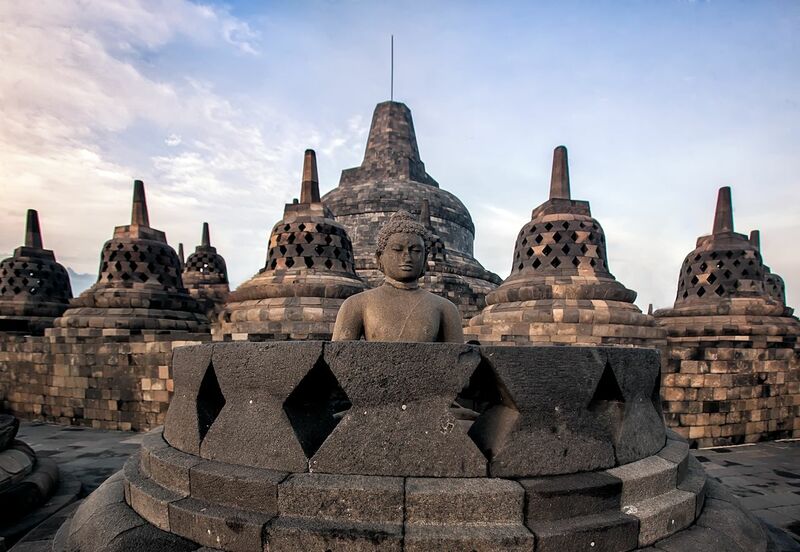 Borobudur is based on Mount Meru in Hindu mythology, and the mandala, a mystic Buddhist symbol of the universe, combining the square as earth and the circle as heaven. The temple was rediscovered in the 19th century by Sir Thomas Stamford Raffles, the British governor of Java. 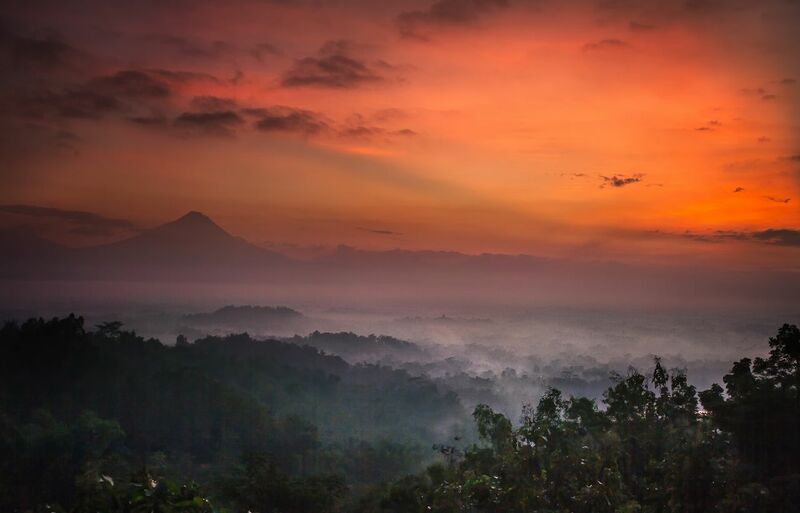 After hearing tales about a mystical sanctuary hidden deep within the island, he organized an excavation to uncover the temple, bringing Borobudur back into the light. Unwittingly, the group damaged the temple in the process as the structure began to deteriorate when exposed to the elements. Stones were also removed and used as building materials; Buddha heads were sold to art collections around the world. represents the cosmos metaphysically and symbolically. 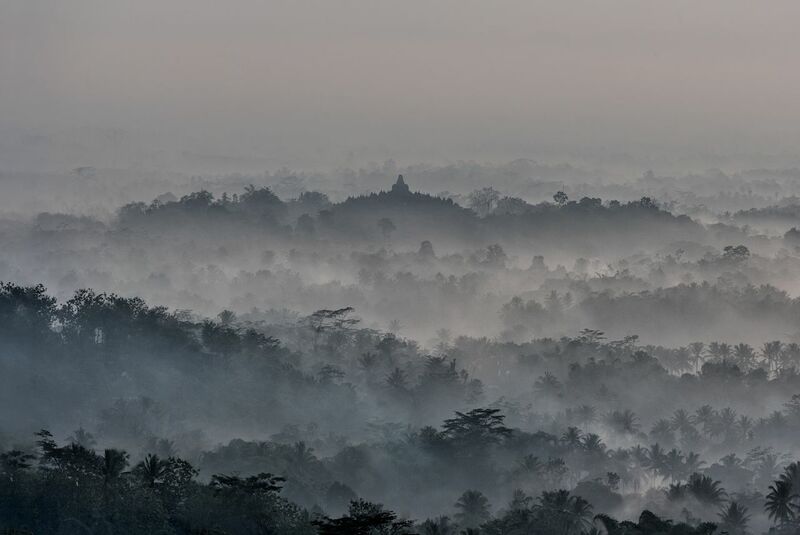 Borobudur is at the same time an open stupa and a “closed world.” This can be perceived intensely inside the temple, where the view is limited by high walls of reliefs, and the verandah structured in such a way that once within, the viewer can’t see other parts of the temple. Its structure resembles that of a pyramid, yet it has been also referred to as a caitya (shrine), a stupa (reliquary), and a sacred mountain. The structure consists of a series of open-air passageways that radiate around a cosmic axis, and ten mounting terraces corresponding to the successive stages and forms Siddhartha assumed before achieving Buddhahood. The monument contains over 500 Buddha statues, nine stacked platforms (the number nine is mystic in Buddhism), six square platforms and three circular, crowned by a central dome. Borobudur represents the ten levels of a Bodhisattva’s life, which one must develop to become a Buddha or an awakened one. Devotees start at the base, traversing clockwise along walkways which gradually ascend to the uppermost level — their physical movement symbolizes the non-physical — or spiritual — path of enlightenment. Moving past the base and through the four galleries, the devotee emerges onto the three upper terraces, encountering 72 stupas, each containing a three-dimensional sculpture of a Buddha enclosed within a stone latticework. The Buddha statues look out into a distance, over the palm groves, limestone hills, and volcanic mountains, enjoying the eternal serenity. 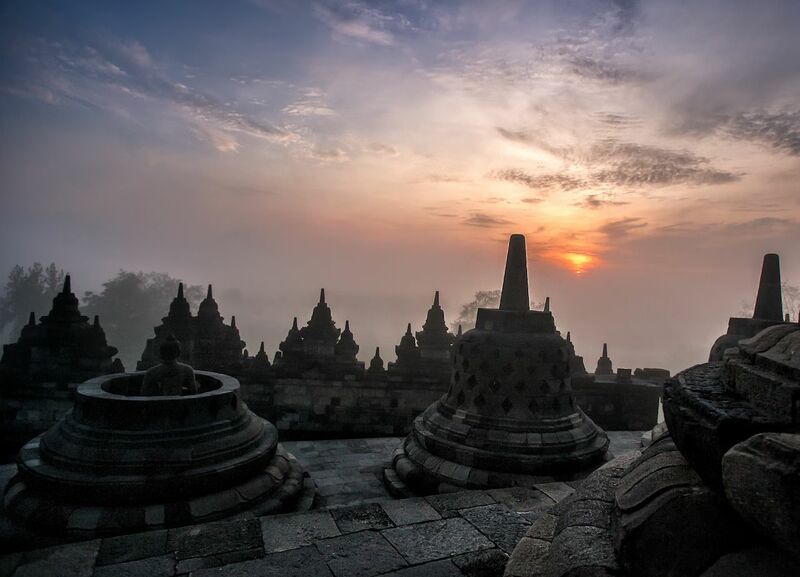 For over 1,200 years, pilgrims traveled to Borobudur to worship and marvel at the thousands of figures carved into the lower tiers of the temple. In these solemn narrative carvings, the insights of faith formed a sequential storytelling framework. Meticulously carved relief sculptures facilitate meditation on a physical and spiritual journey, which guides pilgrims progressively toward higher states of consciousness. Borobudur symbolizes the microcosmos, which is divided into three levels: The first in which man’s world of desire is influenced by negative impulses; the middle level, the world in which man has control of his negative impulses and uses his positive impulses; the highest level, in which the world of a human is no longer bound by physical and worldly desires. The temple’s pathway takes you on a journey from the earthly realm of desire (represented through darkness and the narratives of the structure’s base), through the galleries until you emerge into the realm of light, which is manifested in the open circular terraces.